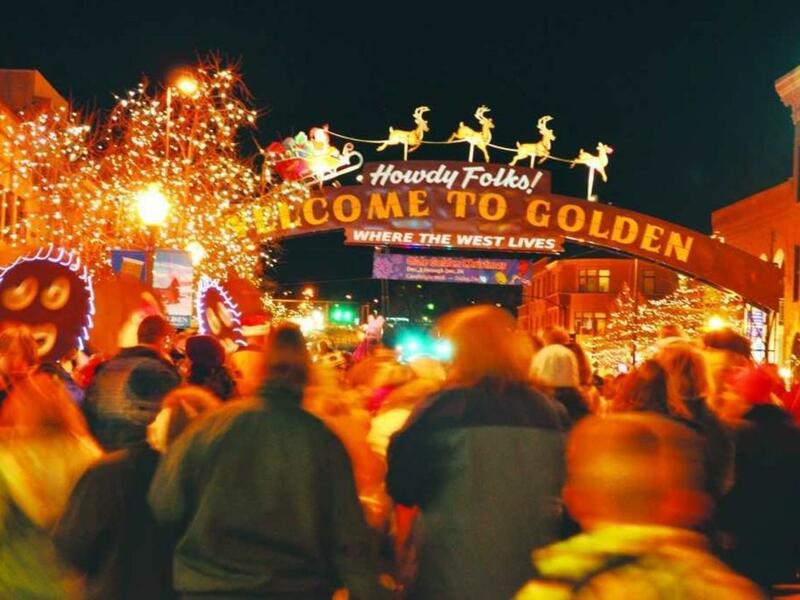 GOLDEN, Colorado | With miles of holiday lights illuminating Golden’s charming downtown and its wooded creekside walking paths, Golden is home to a month long holiday celebration sure to delight. During the day light, there’s plenty to do, from elf-themed 5k runs to holiday shopping in the locally owned stores where shopkeepers often serve hot cider and cookies. The authentic and historic main street of Golden will be the festive location of not one, but three family-fun holiday parades, each filled with prancing horses, floats, bands, carriages, old cars, and of course, Santa Claus. Golden goes all out with holiday lights that illuminate this scenic small city nestled in the foothills. Visitors can stroll through Clear Creek History Park, Golden’s beloved outdoor history park throughout the month of December and thousands of holiday lights will twinkle from the trees along the banks of Clear Creek. You won’t want to miss the Candlelight Walk, which fills the town with carolers, hot cider and the glow of flickering candles. More holiday magic will fill the air when the Polar Express pulls into the North Pole (AKA, the Colorado Railroad Museum) three times a night. There’s no more nostalgic holiday sound than a locomotive steam whistle echoing off the surrounding mesas each time Santa comes on board the train to give every child a silver bell. Here are details on some of the events taking place in the authentic small town streets of downtown Golden. What better way to build up an appetite than a stroll beside fast rushing Clear Creek through the heart of this historic town? Then enjoy turkey and all the trimmings in the warmth of one of Golden’s fine restaurants. The Bridgewater Grill, the Briarwood Inn, and the Table Mountain Inn will all serve spectacular spreads for Thanksgiving. After dinner, sit by the fireplace, but be sure to save room for pumpkin pie. Book your reservation today. Golden Elf Run on Small Business Saturday - November 26, 8:30 a.m.
Locals and visitors alike show support for small town America by shopping for loved ones at Golden’s one-of-a-kind shops. This year, there’s an extra incentive to shop local—the chance to win $100 shopping spree by posting a photo while shopping at a Golden store and tagging @visitgoldenco and the business you’re supporting on Facebook, Instagram or Twitter with #shopsmall. Stop by the Shop Small Welcome Station in front of the Golden Visitors Center on Small Business Saturday for more details. Candlelight Walk—December 2, 6:30 p.m.
It’s a favorite Golden tradition and wonderful way to celebrate the true spirit of the season. Starting from Foothill Art Center, thousands walk down Golden’s main street, candle in hand, singing carols. As the procession moves down each block of Washington Avenue, holiday lights are illuminated. After the walk, Golden offers a number of free and festive activities from roasted chestnuts at the Clear Creek History Park, as well as hot cider and Santa Claus at the Visitors Center. Olde Golden Christmas Parade – Saturdays, December 3, 10, & 17, at 11 a.m.
Saturdays in December, authentic and historic downtown Golden becomes a festive holiday center with traditional decorations and fun family events. The free Olde Golden Christmas Parade starts at 11 a.m. with cowboys on horses, floats, marching bands, old cars, elves on unicycles, the Grinch in his corvette, and of course, Santa Claus. The parade winds down Washington Avenue with lots of activities before and after including snappy barbershop quartets, hot cider, Victorian carolers, and antique fire trucks. Presented by the Golden Chamber of Commerce.